This one is a bit of conundrum.There was no clear explanation for the connection between Katie and the ink. Keeping in mind that a lot of emphasis was laid on the fact that Katie is a foreigner and the Kamu is passed down via generations and culture. Why, how and what consequence does the unexplained link have?The book is full of japanese terms and phrases some of which are explained during the story. I am glad there was a glossary in the back, although I would have personally preferred it at the start to give me some idea and/or prior knowledge of the unknown words to come.The concept is wonderfully creative and the opens the door to many possible avenues. 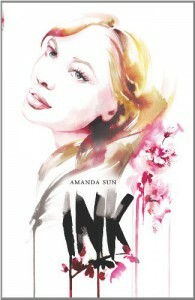 The ink isn't just a tool it is its own entity.What I felt let the story down was the way the author kept very closely to the common en-vogue themes in YA at the the moment. Bad boy treats good girl nasty then he is nice to her and she melts like a swirl of butter in the summer sun. There was so much potential in this concept and yet so little was actually drawn upon.The author needs to throw off those chains of compulsory squee plot points and let her imagination do the walking and her fingers do some more inventive talking.My conundrum is the rating. Despite the execution being nothing more than mediocre one can clearly see the semblance of something truly memorable shining through, hence the higher rating.I am at heart a plot person.I received a free copy of this book via NetGalley.